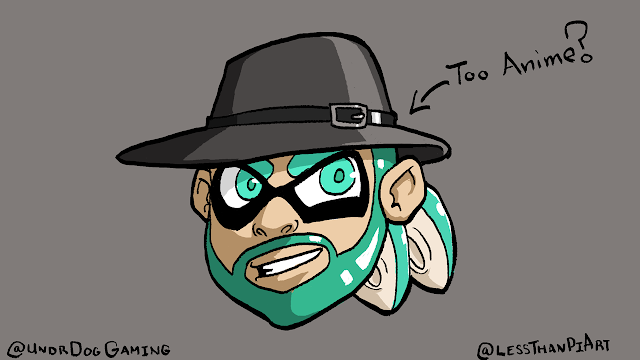 LessThanPi Art: I'm an Undr-Inkling? Got reconnected with an old old buddy of mine from SmashBoards on the brand new Splatoon themed forum SquidBoards. He is (and has been) producing awesome content for years and has; by some kind of reverse miracle; been sneaking Undr everyone's radar including mine! Yeah guys do yourself a favor especially if you are looking for some stellar Splatoon game play and figure out how to get more of Undr. As for me? Well you should be expecting a lot more soon. I've been getting my paint on and I'll have some more "ink" I'll be sharing on my YouTube channel. God bless, be safe, see you next time!